So I tftp'ed the SE5.bin version to my laptop and then put it on unit 2 so that they would match. You have to have them match if you want them to stack. Once I had both images the same, I then erased the config on both of them. Once I wiped the config on both units and reloaded them, I then kept power on unit 1 and powered down unit 2. 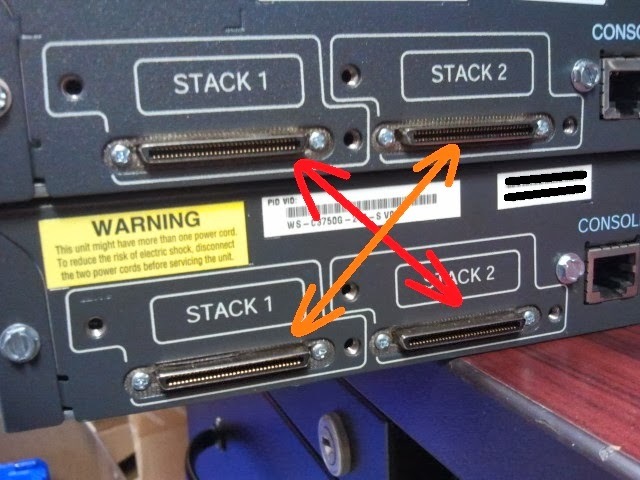 I connected the stacking cables as shown in the picture below. Once connected, I powered unit 2 up and let the stack form.